Use this calculator when shopping or purchasing at retail stores, restaurants or online. It can be used when buying clothes, food, groceries, cars, baby goods, homes, toys, electronics, jewelry, books or anything that has a percent based sale. Find the best deals during Black Friday, Cyber Monday and during the Christmas holiday shopping season. Enter the original price of the product or service. Sale Price = Original Price X (1 - Percent Off). Original Price - This is the retail price or price before the discount. Percent Off - Percentage of the discount. 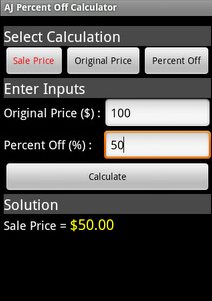 For example, if the item is 50% off, enter 50 in this field. Sale/Discounted Price - The final price of the merchandise after the discount is applied. Amount Saved - The amount of money saved using the discount. Bar Chart - Visual representation of original price and sale price. Pie Chart - Visual representation of original price and amount saved. Note, this chart is hidden if the screen width is too small. If not shown, mobile phone and tablet users can view the site in landscape mode to view the pie chart.